Heavy rainfall in the past few days including yesterday (July 22) has brought the state of Odisha to a standstill. Some places have received extreme amounts of rainfall triggering alarm bells for imminent floods. For example, on Sunday, Burla received a whopping 622 mm of rainfall which was the highest rainfall the state has ever seen, breaking a 26-year-old record of 582 mm recorded in Sambalpur. Three people have died till date in rain-related incidents in the state. According to the Indian Meteorological Department (IMD), 22 districts in the state have received more than 200 per cent rainfall. In 12 of these districts, the rainfall is more than 500 per cent and in three of them the excess rainfall touches 1,000 per cent mark. Sambalpur, Subarnapur and Kendraparha received 265 mm, 216 mm and 81 mm of rainfall which are 1333 per cent, 1747 per cent and 1091 per cent of their normal rainfall. The rainfall has been attributed to a depression formed in the north-west Bay of Bengal and travelled towards Odisha, Bengal, Jharkhand and Chhattisgarh. The IMD has warned seven states—Odisha, West Bengal, Jharkhand, Chhattisgarh, Maharashtra, Madhya Pradesh and Telangana—of heavy rainfall on July 23 and July 24. Across states in India, amidst the growing seasonal deficit of rainfall there still remain a few places that receive excess rainfall on a few days. One example of that is Manipur. It had an overall deficit of 44 per cent on Sunday and is reeling under a seasonal deficit (June 1 to July 22) of 71 per cent but Thoubal district received 567 per cent more rainfall than its normal share. As many as 74 districts spanning 18 states across the country have received 200 per cent excess rainfall. Bikaner in Rajasthan recorded 39.5 mm rainfall while its normal rainfall is just 1.8 mm. This means the city saw 20 times more rain on July 22 than it normally does. On the other hand, most of Bihar might be staring at drought this season with all of its 38 districts except two receiving less than normal rainfall this season. Only Banka and Pachim Champaran have received excess rainfall of 9 per cent and 1 per cent. In 22 of these districts, the situation is rather dire. They have received at least 50 per cent deficit rainfall since June 1. These districts comprise of more than half the state by area. Nine of these districts have received 70 per cent less than normal rainfall. 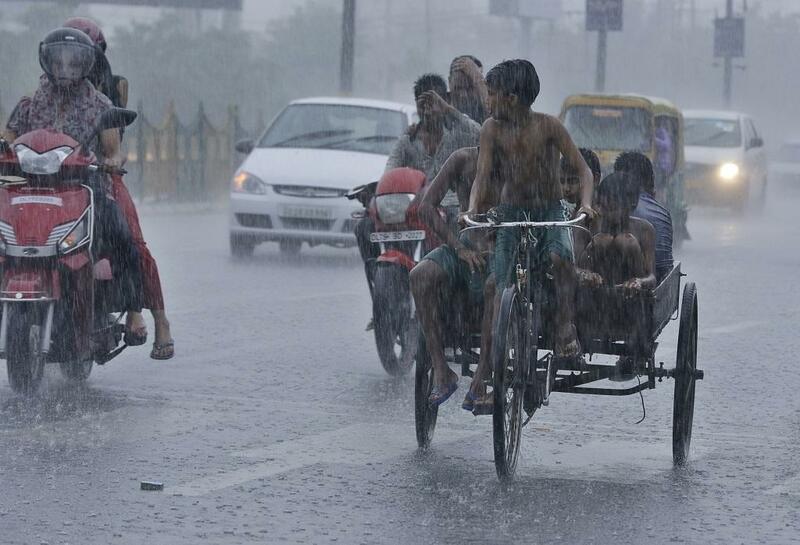 Vaishali has seen the leanest season in terms of rainfall with a deficit of 85 per cent. Bihar has an overall deficit this season of 47 per cent. But even in this pall of gloom, some districts in the state have received more than normal rainfall on July 22. Aurangabad, Bhabua and Jahanabad received 721 per cent, 493 per cent and 244 per cent more rainfall than normal. But this rainfall could prove to be too late to alter the situation in the state.